Each $59 box contains 20 packs. Each pack contains 8 cards. 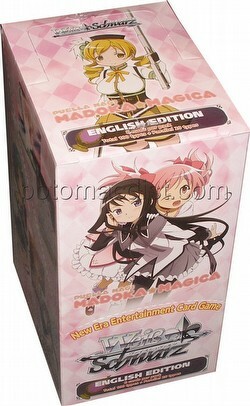 Each Weiss Schwarz Puella Magi Madoka Magica box includes 20 packs. One of five different promo cards will be included in each box as a bonus. Exclusive SP Gold Foil/Hot Stamped signed cards from the original Japaense voice actresses are randomly inserted - Aoi Yuki (Madoka Kaname), Chiwa Saito (Homura Akemi), Eri Kitamura (Sayaka Miki), Kaori Mizuhashi (Mami Tomoe), and Ai Nonaka (Kyoko Sakura). There are 100 different cards in the set (8 RR, 20 R, 28 U, 32 C, 12 CX, 20 Parallel - 5 SP, 5 RRR, & 10 SR).